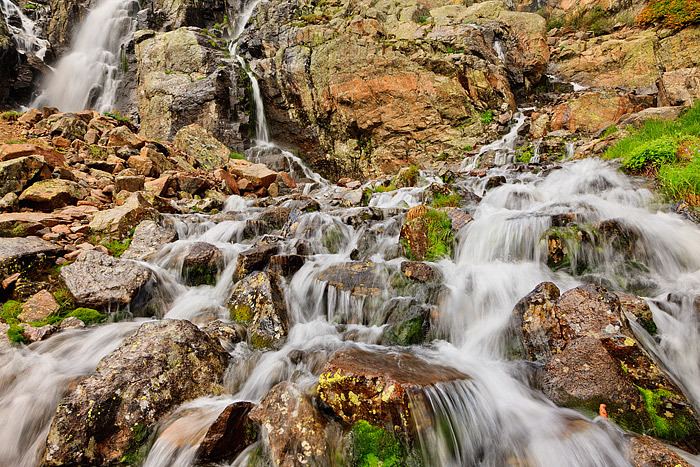 One of the more impressive water features in Rocky Mountain National Park is certainly Timberline Falls located in Loch Vale. Located just below the outlet to Lake of Glass, Timberline Falls is an impressive series of waterfalls cascading over boulders and rocks. Hikers heading to Lake of Glass and Sky Pond also will fondly remeber Timberline Falls, as the trail to those two lakes require that one scale and boulder over the right side of Timberline Falls to reach the shelf where Lake of Glass lays. While not a technical climb, scalling the side of Timberline Falls wet and slippery rocks requires some concentration and attention. The payout for scalling Timberline Falls is great however, as Lake of Glass and Sky Pond are one of the most beautiful areas in all of Rocky Mountain National Park. Photo © copyright by Thomas Mangan.